﻿Published by Sareth Ney on June 15, 2017 at 1:10 p.m.
ORLANDO, Fla. - Rage and Rapture North American Tour will be making a stop at Hard Rock Live, on Aug. 17. The trek consists of Blondie, Garbage and Deap Vally. It begins on July 17 at Artpark Amphitheater in Lewiston, N.Y. On Aug 17, Sports Palace in Mexico City, Mexico hosts the final date. Debbie Harry (vocalist), Chris Stein (guitarist), Clem Burke (drummer), Leigh Fox (bassist), Tommy Kessler (guitarist) and Matt Katz-Bohen (Keyboards, piano, organ) are the members of Blondie. Forming over 40 years ago, Blondie recorded 14 albums: “Blondie”, “Plastic”, “Parallel Lines”, “Eat To The Beat”, “Autoamerican”, “The Hunter”, “One More Into The Bleach”, “Remixed Remade Remodeled: The Blondie Remix Project”, “Picture This Live”, “Live”, “Panic of Girls”, “Blondie 4(O)-Ever: Greatest Hits Deluxe Redux”/”Ghosts of Download”, “Real Real Blondie (Live)” an d “Pollinator”. “Pollinator” was Blondie’s latest and featured 11 tracks: “Doom or Destiny”, “Long Time”, “Already Naked”, “Fun”, “My Monster”, “Best Day Ever”, “Gravity” and more. Shirley Manson (lead vocalist), Duke Erikson (bassist, rhythm guitarist, keyboardist), Steve Marker (lead guitarist) and Butch Vig (drummer) are the four piece which make up Garbage. They are an alternative band and are part of the STUNVOLUME roster. In 1995, Almo Sounds/Mushroom distributed Garbage’s self-titled album. Sony Music Japan made “Special Collection” available, in 2002. “Absolute Garbage” was purchasable, in 2007. The standard version had 18 songs and the special edition had 31. For record store day in 2012, “Battle In Me” was made available. It featured two songs, “Battle in Me” and “Blood for Poppies”. Singles, compilations and visual releases were also obtainable. Lindsey Troy (guitarist, vocalist) and Julie Edwards (drummer and vocalist) are the duo which makes up Deap Vally. They are a rock and roll pair from Los Angeles. They are part of the Nevado Music and Cooking Vinyl rosters. Formed on March 6, 2011—Deap Vally latest LP (long play) was “Femejism”. It was available on Sept. 16, 2016. With a running time of 49 minutes, 13 songs were part of the project including: “Royal Jelly”, “Julian”, “Gonnawanna”, “Little Baby Beauty Queen”, “Smile More”, “Critic”, “Post Funk”, “Two Seat Bike”, “Bubble Baby”, “Teenage Queen”, “Grunge Bond”, “Turn It Off” and “Heart Is an Animal”. 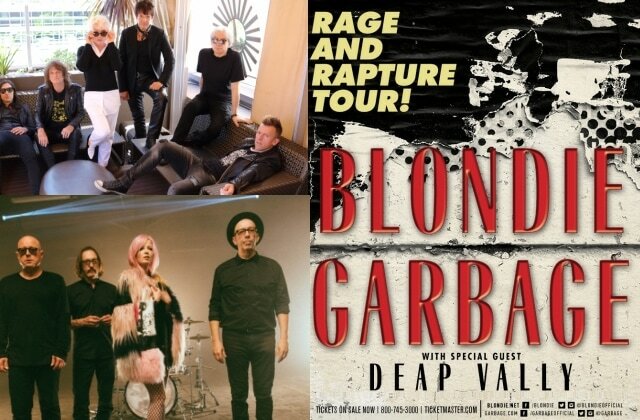 ​Tickets to attend the Hard Rock Live stop of the Rapture and Rage Tour range from $47.50 to $120.50 and exclude fees. Doors will open at 7 p.m. and music begins at 8 p.m.
July 25 - Artpark Amphitheater, Lewiston, Ky.
July 28 - Count Basie Theatre, Red Bank, N.J.
July 29 - Bethel Woods Center for the Arts, Bethel, N.Y.
Aug. 3 - Filene Center at Wolf Trap, Vienna, Va.
Aug. 5 - The Red Hat Amphitheater, Raleigh, N.C.
Aug. 8 - Seminole Hard Rock Live Arena, Hollywood, Fla.
Aug. 9 - Hard Rock Live, Orlando, Fla.